Spondyloarthropathy is recognized as far back as the Permian, 300 million years before present, increased in prevalence over geologic and modern time and is now essentially trans-mammalian in distribution. Four aspects allow spondyloarthropathy to be studied across phylogenetic lines and through time: Stability of disease characteristics and its spectrum, occurrence sufficiently early in life to for remains to be identified, absence of bias in skeletal preservation and lack of significant effect on organismal survival. Identified in mammal-like reptiles, dinosaurs and other more recent reptiles, it is with mammals that the disease became endemic. It strongly penetrated some early mammal lineages which were short-lived, in contrast to its geometric increase in population penetrance over geologic time. Prevalence increased seven fold in horses, rhinoceros and non-human primates and its current occurrence is independent of captive or free-ranging status. In addition to inflicting musculoskeletal morbidity, the disease is associated with behavior changes, some possibly related to interferon modulation. Spondyloarthropathy is considered a disease and rightly so, given its impact on mobility, health and behavior. However, it seems paradoxical that a phenomenon which has such negative effects would persist, let alone increase in population penetrance. 1. Rothschild BM, Martin LD. Skeletal Impact of Disease. New Mexico Museum of Natural History, Albuquerque 2006. 3. Rothschild BM, Feldtkeller E. Spondyloarthritis in antiquity and history. In: Oxford Textbook of Axial Spondyloarthritis, Edited by Inman R, Sieper J. Oxford University Press, Oxford; 2016: 1-12. doi: 101093/med/ 9780198734444.001.0001. 4. Rothschild BM, Rothschild C. Trans-mammalian pandemic of inflammatory arthritis (Spondyloarthropathy variety): Persistence since the Pleistocene. Paleontol Soc Publ 1996; 8: 330. 5. Rothschild BM, Rothschild C. Epidemic of spondyloarthropathy in baboons. J Med Primatol 1996; 25(1): 69-70. doi: 10.1111/j.1600-0684.1996. tb00196.x. 6. Rothschild BM, Woods RJ. Spondyloarthropathy: Erosive arthritis in representative defleshed bones. Amer J Phys Anthropol 1991; 85(2): 125-34. doi: 10.1002/ajpa. 1330850202. 7. Rothschild BM, Woods RJ. Reactive erosive arthritis in chimpanzees. Amer J Primatol1991; 25(1): 49-56. doi: 10.1002/ ajp.1350250105. 8. Rothschild BM, Rothschild C. Treponemal disease revisited: Skeletal discriminators for Yaws, Bejel, and venereal syphilis. Clin Infect Dis 1995; 20(5): 1402-8. doi: 10.1093/clinids/ 20.5.1402. 9. Rothschild BM, Woods RJ, Rothschild C, Sebes JI. Geographic distribution of rheumatoid arthritis in ancient North America: Implications for pathogenesis. Semin Arthritis Rheum1992; 22(3): 181-7. doi: 10.1016/0049-0172(92) 90018-9. 10. Rothschild BM. 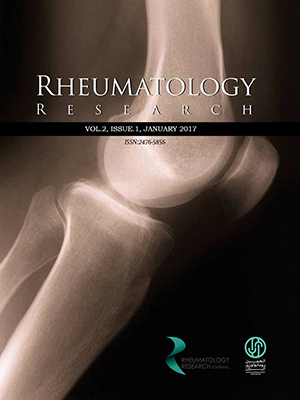 Paleopathology, its character and contribution to understanding and distinguishing among rheumatologic diseases: Perspectives on rheumatoid arthritis and spondyloarthropathy.Clin Exp Rheumatol1995; 13(5): 657-62. 11. Rothschild BM, Woods RJ. Implications of osseous changes for diagnosis of spondyloarthropathy. J Orthop Rheumatol 1992; 5: 155-62. 12. Rothschild BM, Rothschild C. Nineteenth century spondyloarthropathy independent of socioeconomic status: Lack of skeletal collection bias. J Rheumatol 1993; 20: 314-19. 13. Lyman RE. Vertebrate Taphonomy. University of Cambridge, Cambridge, 1994. 14. Rothschild BM, Schultze HP, Peligrini R. Herpetological Osteopathology: Annotated Bibliography of Amphibians and Reptiles. Springer-Verlag, Heidelberg, Germany, 2012. 15. Redelstorff R, Hayashi S, Rothschild BM, Chinsamy A. Vertebral fusion in two Early Jurassic sauropodomorph dinosaurs from the Lufeng Formation of Yunnan, China. Acta Palaeontol Polon 2015; 60: 643-649. 16. Rothschild BM, Molnar RE. 2008. Tyrannosaurid pathologies as clues to nature and nuture in the Cretaceous. In: Tyrannosaurus rex, the Tyrant King, Edited by Larson P, Carpenter K. Indiana University Press, Bloomington, 2008: 287-306. 17. Rothschild BM, Everhart MJ. Co-ossification of vertebrae in mosasaurs (Squamata, Mosasauridae); Evidence of habitat interactions and susceptibility to bone disease. Trans Kansas Acad Sci2015; 118 (3 & 4): 265-75. doi: 10.1660/062.118.0309. 18. Rothschild BM. Macroscopic Recognition of Non-traumatic Osseous Pathology in the Post-cranial Skeletons of Crocodilians and Lizards. J Herpetol 2010; 44(1): 13-20. doi: 10.1670/08-243.1. 19. Rothschild BM, Sebes JI, Rothschild C. Antiquity of arthritis: Spondyloarthropathy identified in the Paleocene of North America. Clin Exp Rheumatol 1998; 16(5): 573-5. 20. Steel RG, Torrie JH. Principles and Procedures of Statistics, with Special Reference to the Biological Sciences. McGraw-Hill, New York, 1960. 21. Rothschild BM, Prothero DR, Rothschild C. Origins of spondyloarthropathy in Perissodactyla. Clin Exp Rheum 2001; 19(6): 628-32. 22. Rothschild BM. Arthritis in Callithrix jacchus: Calcium pyrophosphate deposition disease and spondyloarthropathy.J Med Primatol 1993; 22: 313-6. 23. Rothschild BM, Woods RJ. Spondyloarthropathy in gorillas. Semin Arthritis Rheum l989; 18(4): 267-76. doi: 10.1016/0049-0172(89)90048-6. 24. Rothschild BM, Woods RJ. Erosive arthritis and spondyloarthropathy in Old World primates. Amer J Phys Anthropol 1992; 88(3): 389-400. doi: 10.1002/ajpa.1330880310. 25. Rothschild BM, Woods RJ. Spondyloarthropathy as an Old World phenomenon. Semin Arthritis Rheum1992; 21(5): 306-16. doi: 10.1016/0049-0172(92)90024-8. 26. Rothschild BM, Woods RJ. Arthritis in New World monkeys: Osteoarthritis, calcium pyrophosphate deposition disease and spondyloarthropathy. Intl J Primatol 1993; 14(1): 61-78. doi: 10.1007/bf02196503. 27. Rothschild BM, Woods RJ. Inflammatory arthritis in Pongo. J Med Primatol 1996; 25(6): 414-8. doi: 10.1111/j.1600-0684.1996. tb00037.x. 28. Rothschild BM, Rühli FJ. Comparison of arthritis characteristics in lowland Gorilla gorilla and mountain Gorilla beringei. Amer J Primatol 2005; 66(3): 205-18. doi: 10.1002/ ajp.20139. 29. Rothschild BM, Rühli FJ. Etiology of reactive arthritis in Pan paniscus, Pan troglodytes troglodytes and Pan schweinfurthii. Amer J Primatol 2005; 66(3): 219-31. doi: 10.1002/ajp.20140. 30. Rothschild BM. Osteoarthritis as a complication of artificial environment: The Cavia (guinea pig) story. Ann Rheumatic Dis 2003; 62(10): 1022-23. doi: 10.1136/ard.62.10.1022. 31. Rothschild BM, Hong N, Turnquist JE. Skeletal survey of Cayo Santiago rhesus: Osteoarthritis and apical plate excrescences. Semin Arthritis Rheum 1999; 29(2): 100-11. doi: 10.1016/s0049-0172(99)80041-9. 32. Rothschild BM, Hong N, Turnquist JE. Naturally occurring spondyloarthropathy in Cayo Santiago Rhesus macaques. Clin Exp Rheumatol 1997; 15(1): 45-51. 33. Rothschild BM, Wang XM, Cifelli R. Spondyloarthropathy in Ursidae: A Sexually Transmitted Disease? Natl Geographic Res Expl 1993; 9: 382-4. 34. Feng Y1, Ding J, Fan CM, Zhu P. Interferon-γ contributes to HLA-B27-associated unfolded protein response in spondyloarthropathies. J Rheumatol 2012; 39(3): 574-82. doi: 103899/jrheum.101257. 35. Filianoi A, Xu Y, Tustison NJ, Marsh RL, Baker W, Smirnov I, et al. Unexpected role of interferon-γ in regulating neuronal connectivity and social behavior. Nature 2016; 535(7612): 425-9. doi: 10.1038/nature18626. 36. Rothschild BM, Rothschild C. No laughing matter: Spondyloarthropathy in Hyaenidae. J Zoo Wildlife Med1994; 25: 259-63. 37. Rothschild BM, Rothschild C, Woods RJ. Inflammatory arthritis in large cats: An expanded spectrum of spondyloarthropathy. J Zoo Wildlife Med 1998; 29: 279-84. 38. Rothschild BM, Rothschild C, Woods RJ. Inflammatory arthritis in canids: Spondyloarthropathy. J Zoo Wildlife Med 2001; 32(1): 58-64. doi: 10.1638/1042-7260(2001)032[0058: iaics]2.0. co;2. 39. Inman Rd, Perl A, Phillips PE. Infectious agents in chronic rheumatic disease. In: Arthritis and Allied Conditions: A Textbook of Rheumatology, Edited by Koopman WJ, 12th edn. William & Wilkins, Baltimore, 1997: 585-608. 40. Resnick D. Diagnosis of Bone and Joint Disorders. Saunders, Philadephia, 2002. 41. Ahvonen P, Sievers K, Aho K. Arthritis associated with Yersinia enterocolitica infection. Acta Rheum Scand 1969; 15(1-4): 232-53. doi: 10.3109/rhe1.1969. 15.issue-1-4.32. 42. Buxton JA, Fyfe M, Berger S, Cox MB, Northcott KA and the Multiprovincial Salmonella typhimurium Case-Control Study Group. Reactive arthritis and other sequelae following sporadic Salmonella typhimurium infection in British Columbia, Canada: A case control study. J Rheumatol 2002; 29(10): 2154-8. 43. Hannu T, Mattila L, Rautelin H, Pelkonen P, Lahdenne P, Siitonen A, et al. Campylobacter-triggered reactive arthritis: A population-based study. Rheumatol 2002; 41(3): 312-8. doi: 10.1093/ rheumatology/41.3.312. 44. Kvien TK, Glennas A, Melby K, Granfors K, Andrup O, Karstensen B, et al. Reactive arthritis: Incidence, triggering agents and clinical presentation. J Rheumatol1994; 21(1): 115-22. 45. Zeidler H, Kuiopers J, Kohler L. Chlamydia-induced arthritis. Curr Opin Rheumatol 2004; 16(4): 380-92. doi: 10.1097/01.bor. 0000126150.04251.f9. 46. Rothschild BM, Woods RJ. Character of pre-Columbian North American spondyloarthropathy. J Rheumatol 1992; 19: 1229-35. 47. Muncie HL, Campbell J. Alpha and beta thalassemia. Amer Fam Phys 2009; 80: 339-44. 48. Steinberg B. Sickle Cell Anemia. Arch Pathol 1930; 9: 876-97. 49. Aidoo M, Terlouw DJ, Kolczak MS, McElroy PD, ter Kuile FO, Kariuki S, et al. Protective effects of the sickle cell gene against malaria morbidity and mortality. Lancet2002;359(9314): 1311-2. doi: 10.1016/s0140-6736(02) 08273-9. 50. Bendele AM. Animal models of rheumatoid arthritis. J Musculoskel Neuron Interact 2001; 1(4): 377-85. 51. Carr AP, Michels G. Identifying noninfectious erosive arthritis in dogs and cats. Veterin Med1997; 92: 804-10. 52. Rothschild BM. Two faces of "rheumatoid arthritis": Type A versus type B disease. J Clin Rheumatol1997; 3(6): 334-8. doi: 10.1097/00124743-199712000-00006. 53. Rothschild BM, Woods RJ, Ortel W. Rheumatoid arthritis "In the buff": Erosive arthritis in representative defleshed bones. Amer J Phys Anthropol 1990; 82(4): 441-9. doi: 10.1002/ajpa. 1330820406. 54. Anderson RM, May R.M. Infectious Diseases of Humans: Dynamics and Control. Oxford University Press, Oxford, UK, 1991. 55. Arneberg P, Skorping A, Grenfell B, Read AF. Host densities as determinants of abundance in parasite communities. Proc R Soc Lond Ser B 1998; 265(1403): 1283-9. doi: 10.1098/rspb.1998. 0431. 56. Harvell CD, Kim K, Burkholder JM, Colwell RR, Epstein PR, Grimes DJ, et al. Emerging marine diseases: climate links and anthropogenic factors. Science 1999; 285(5433): 1505-10. doi: 10.1126/science.285.5433.1505. 57. Møller AP, Dufva R, Allander K. Parasites and the evolution of host social behavior. Adv Study Behav1993; 22: 65-102. doi: 10.1016/s0065-3454(08)60405-2. 58. Moore, J. Parasites and the Behavior of Animals. Oxford University Press, Oxford, UK, 2002. 59. Nunn CL, Altizer SM. Infectious Diseases in Primates: Behavior, Ecology and Evolution. Oxford University Press, Oxford, UK, 2006. 60. Nunn CL, Altizer S, Jones KE, Sechrest W. Comparative tests of parasite species richness in primates. Amer Nat 2003; 162(5): 597-614. doi: 10.1086/378721. 61. Nunn CL, Gittleman JL, Antonovics J. Acomparative study of white blood cell counts and disease riskin carnivores. Proc R Soc London Seri B Biol Sci 2003; 270(1513): 347-56. doi: 10.1098/rspb.2002.2249. 62. Poulin R, Morand S. Parasite Biodiversity. Smithsonian Institution Press, Washington, DC; 2004. 63. Rothschild B, Breit S. Recognition and breed specificity of canine spondyloarthropathy. J Spine2016; 43: 1251-2. 64. Nunn C, Rothschild BM, Gittleman J. Why are some species more commonly afflicted by arthritis than others? A comparative study of spondyloarthropathy in primates and carnivores. J Evol Biol 2007; 20(2): 460-70. doi: 10.1111/j. 1420-9101.2006.01276.x.